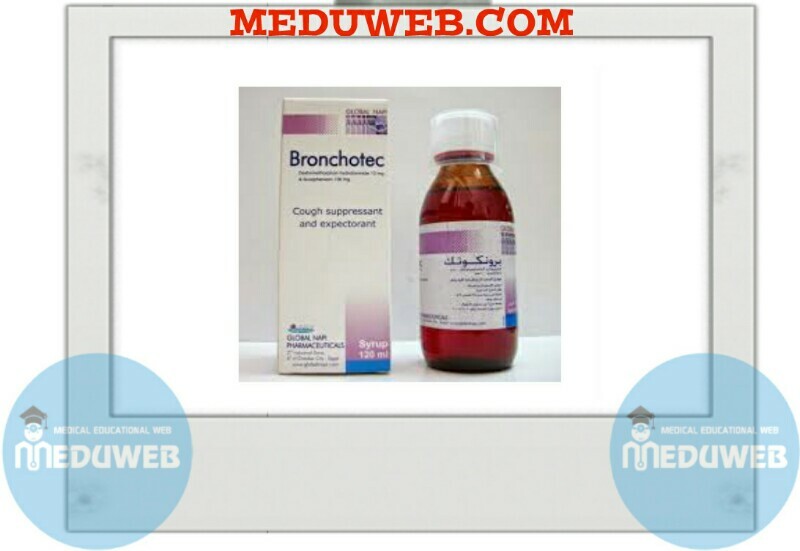 Bronchotec is a combination of guaiphenesin an dextromethorphan.Guaiphenesin enhances the output of respiratory tract fluid by reducing adhesiveness and surface tension facilitating the removal of viscous mucus (sputum) and helps as expectorant for productive cough. Dextromethorphan, d-isomer of the codeine analogue oflevorphanol, acts centrally on the cough centre in the medulla of the brain, elevates the threshold for cough stimulus in the medulla and suppresses non-productive dry cough. It lacks analgesic and addictive properties. It has little sedative activity. Bronchotec, by the dual action of its two components, aims to make cough less frequent anc more easily productive. Bronchotec is absorbed from the gastro-intestiru tract. It is metabolised in the liver and excreted in the urine as unchanged. dextromethorphan and demethylated metabolites such as dextrophan Which has some coug suppressant activity. 1- Cough caused by minor throat and bronchial irritation due to cold. 2- As expectorant to help loosen phlegm and bronchial secretions to make cough more productive. Incidence appear to be rare and may include dizziness gastro-intestinal disturbances sueh as nausea, vomiting; headache; rash (including urticaria). vomiting should use only under medical supervision. – Pregnancy: As with other medications, seek the advice of the doctor before taking this medication. – Lactation: As with other medications, seek the advice of the doctor before taking this medication. Children :Bronchotec is not recommended to children under 2 years of age. – For children from 2 – 6 years of age, Bronchotec should be given under the doctor’s supervision. Monoamine oxidase inhibitors (MAOIs): Avoid concomitant administration with Bronchotec, as it may cause severe and sometimes fatal reactions. Anti-arrhythmics: Such as amiodarone and quinidine increase serum concentrations of dextromethorphan. If there is any doubt about drug-drug interactions, seek medical advice. – Adults and children over 12 years of age: 10 ml to be taken three to four times daily. 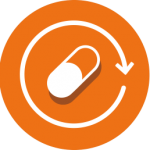 – Children from 6 to 12 years of age: 5 ml to be taken three to four times daily. – Children from 2 to 6 years of age: 2.5 ml to be taken three to four times daily under the doctor’s supervision. – Bronchotec syrup is supplied in bottles of 120 ml each with a plastic measuring cup. 6 of October City – Egypt.